Although Japan has now passed the 10 GW in cumulative solar PV installation, more than half of the installed capacity is on residential rooftops. 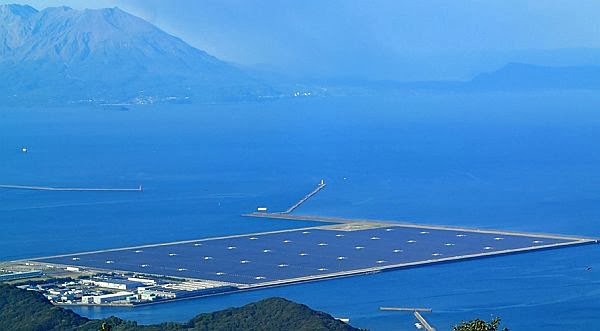 The largest single solar farm in Japan is currently the one in the southern city of Kagoshima. It has just been brought online this week according to pv-magazine. The 70 MW PV plant is run and owned by local utility provider, the Kagoshima Mega Solar Power Corporation, and relies on system technology provided by Germany’s SMA. SMA has provided 140 Sunny Central 500CP-JP central inverters, and 1,260 Sunny String-Monitors for the plant, which is now the largest single solar farm in Japan. SMA has established a keen presence in Japan in recent years, setting up a sales and service company in Tokyo and having its Sunny Boy inverters certified by the Japan Electrical Safety & Environment Technology Laboratories (JET) for use in rooftop arrays for the Japanese market. Even though JET certification is not required for central inverters used on industrial-scale solar projects, SMA felt compelled to ensure that its Sunny Boy technology would be able to withstand the multitude of adverse weather conditions that panels in southern Japan can sometimes be subjected to – conditions including typhoons, high humidity and salty air. TheGreenMechanics: With rapid growth of solar PV industry there, Japan is thought to be the new Germany in renewable energy sector, particularly solar. It will come as no surprise if Japan can quickly fill the gap left behind by the subsequent shutting down of nuclear power plants in response to the Fukushima Daiichi nuclear disaster. Wow!This is huge compared to ours.